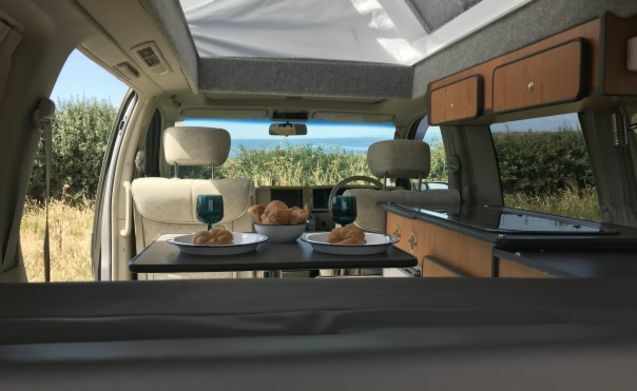 Explore the south coast, New Forest and beyond in a converted Nissan Elgrand campervan. 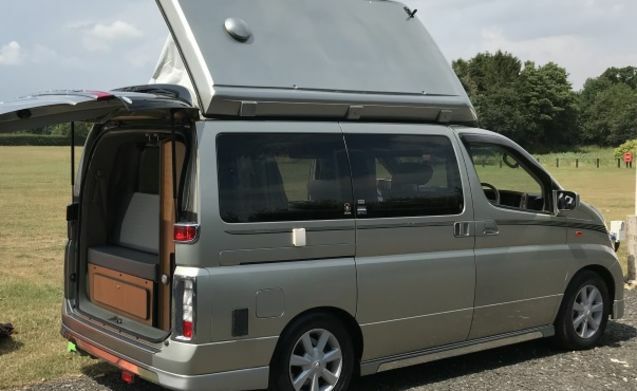 TJ arrived in the UK from Japan in 2015. 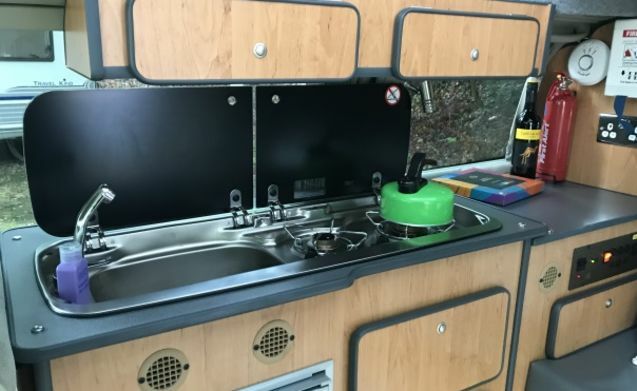 Soon after, he was converted into a campervan with pop top roof and mod cons added, including fridge, sink and two gas hobs. 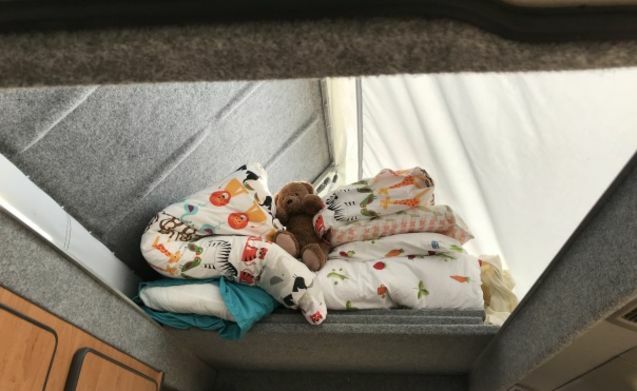 Perfect for families or couples, he can sleep two adults on the rock and roll bed down below, and up to two children or one adult in the pop top roof. 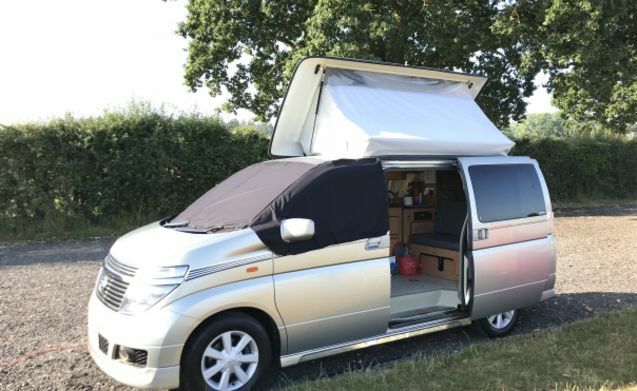 TJ is a Nissan Elgrand (a luxury MPV in Japan), and is a really easy drive with its powerful 3.5 litre V6 engine, 4 wheel drive, automatic gearbox and reversing camera. The vehicle isn't much bigger than your average people carrier, yet has everything you need including some nifty storage solutions. TJ is always looking for adventure. Book him for his next today! There are two belted pilot seats in the front, and two belted seats in the rear. All have 3 point belts. 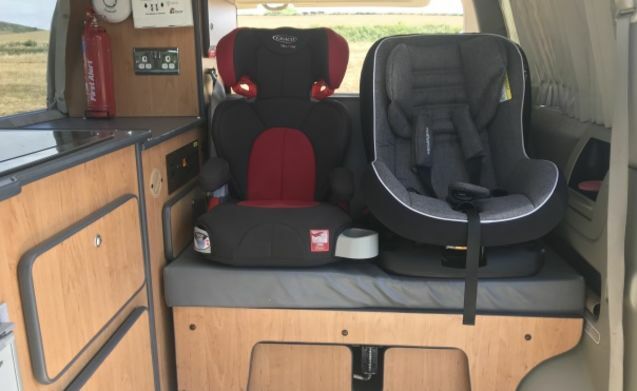 They all can accommodate child and baby seats (rear and forward facing). The front passenger seat is a swivel chair. Driver and front passenger airbags. 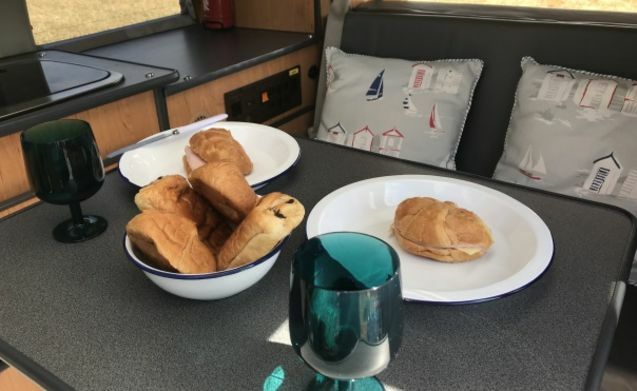 There is sociable seating for three people inside the van when stationary (plus foldaway table), and two camping chairs included in the hire for use outside. See extras for additional chairs. 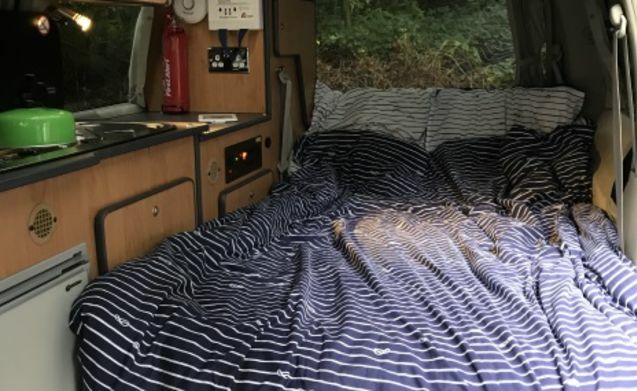 TJ has a narrow double rock and roll bed in the main section of the van which sleeps up to two adults, and the bed in the popup roof would suit either one adult or two children. See extras for bedding and towels, or you may bring your own. There are 3 small cupboards available in the kitchenette, 2 to the rear and some space for bags behind the back seats. 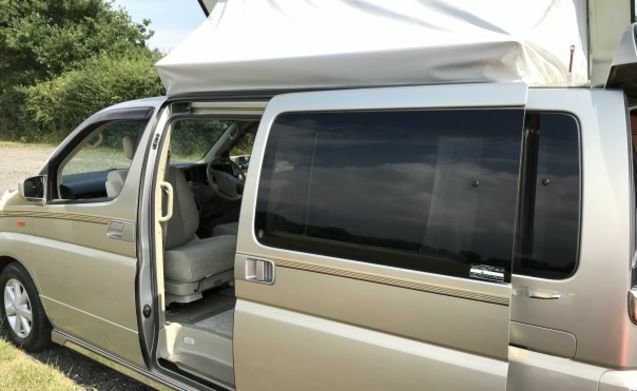 The vehicle is compact so if you are travelling with several people you will need to pack lightly. We can include a small tent which can be used for storage. There are no toilet or shower facilities on board TJ. Sheets, duvet and pillows - please ask if you would like sleeping bags instead. 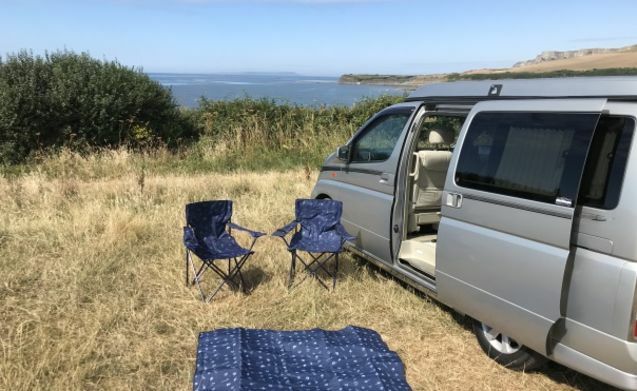 Two camping chairs for use outside (and a small table) are already included in your booking. 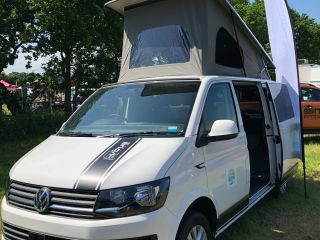 An inflatable drive-away awning (Vango Kela 2 Standard) increases your available space, and has a removable bedroom inner tent for an extra sleeping space. Ideal for families. Full instructions and pump included. 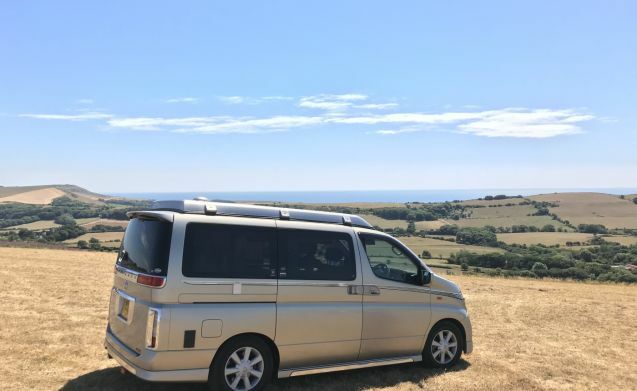 Conveniently located in Bournemouth, just two hours out of London, it's a great starting point from which to explore the south coast and New Forest. 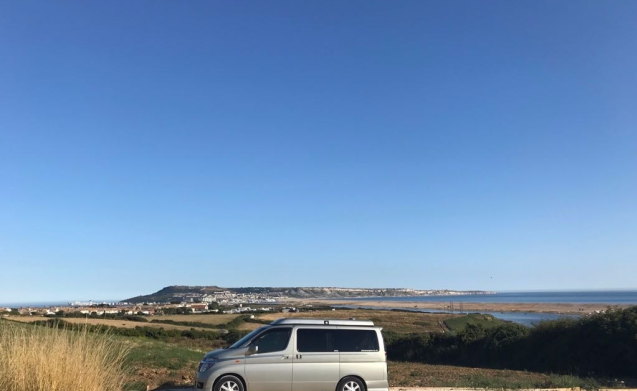 We can drop the van off to you direct and collect from anywhere in within half an hour of Bournemouth or we can arrange to pick up guests from local transport hubs. Guests are welcome to leave their car at our property for the duration of their stay (at their own risk). 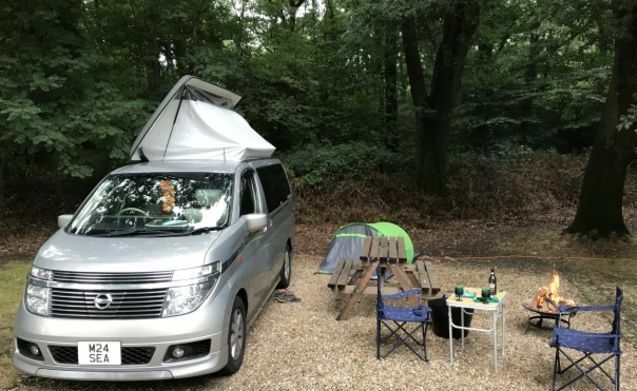 When you collect the van we will show you all you need to know about how the campervan works as well as providing a welcome pack with full instructions to take with you. We are contactable 24hrs a day if you need help. We try to be as flexible as possible, just send us a message if there is any request not outlined and any other enquiries please just ask. There is a refundable deposit of £500 (may be higher for drivers 21-24) held against damage. TJ has a 24hr breakdown recovery in case of any issues, and is fully insured for the hirer (depending on meeting insurance criteria). Driving notes: please bear in mind height restrictions when planning your journey, TJ is 2.2 metres high. We operate a full to full fuel policy. Please bring TJ back clean or additional cleaning charges may apply, you don't need to clean the outside. Response from Jane Thanks Tamara, glad to hear you had a good trip! 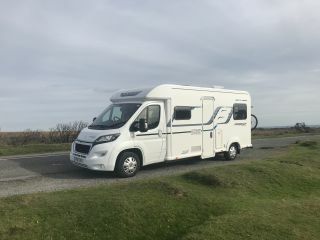 Response from Jane Thanks Shane, glad you guys had a good trip - Thanks for taking TJ on another Cornish adventure!